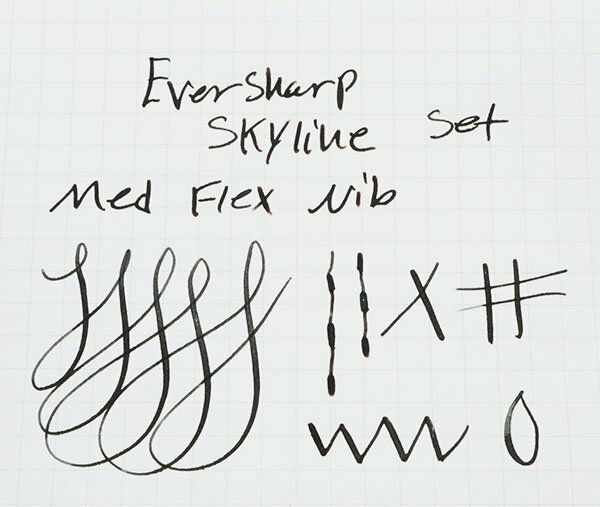 Rather uncommon low end of the Eversharp Skyline line (fountain pen and mechanical pencil set) -- the Streamliner. 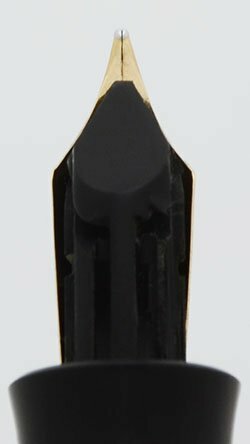 Black with flexible medium nib. Excellent restored condition. 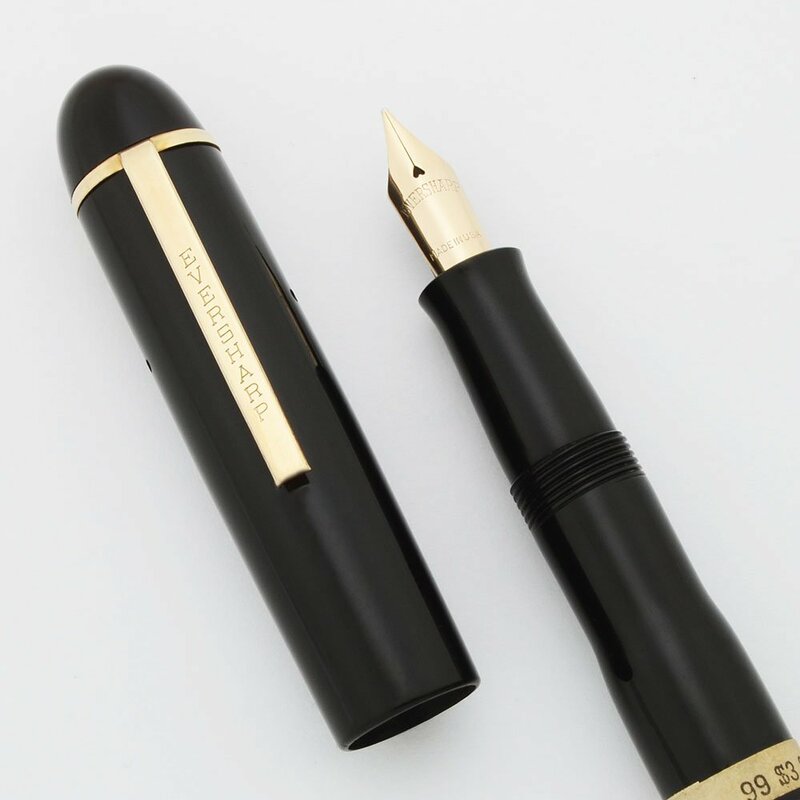 Product Name Streamliner .... this is similar to the Skyline pens, but lacks a cap band and a piece that goes over the top of the deby. Commonly mistaken for a Skyline. Length Pen is 5-1/8" pencil is 5-1/4"
Filling System Lever filling system (new sac installed). The pencil fills in the modern, click method. It takes 1.1mm (or "thick") leads. Color Black with gold plated trim. Nib Flexible medium Eversharp nib. Marked Flexible on the paper tag, but the flex is not dramatic. See the writing sample, below. Condition The set is shiny and nice and sits in the original Eversharp cardboard box with a brown tweed surface and an ecru paper interior. 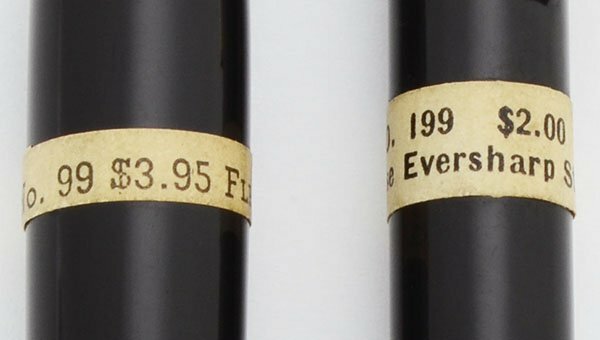 Both pieces have the original price tags encircling the barrels. The fountain pen feed is missing one of the ridges, as can be seen in he photo, but this will not affect writing. There are light horizontal marks caused by capping and some light scratches on the section, otherwise light signs of usage only. The clip and trim have some scratching but the imprints are clear. The mechanical pencil is also very nice. There is a bulge midway on the pencil cap, the result of some plastic skrinkage. Imprints are clear. No cracks, dings, or personalization.